The outcome of a one-time event or of repeated impact through athletic activity, equine osteoarthritis results in inflammation and, eventually, cartilage damage. Equine osteoarthritis is a progressive, chronic disease that causes the degeneration of joints, resulting in pain, stiffness, and lameness in horses. A leading cause of equine lameness, equine osteoarthritis mainly affects the leg joints or the synovial joints—hock, fetlock, pastern, coffin, stifle, and knee—but can also involve the back and neck. 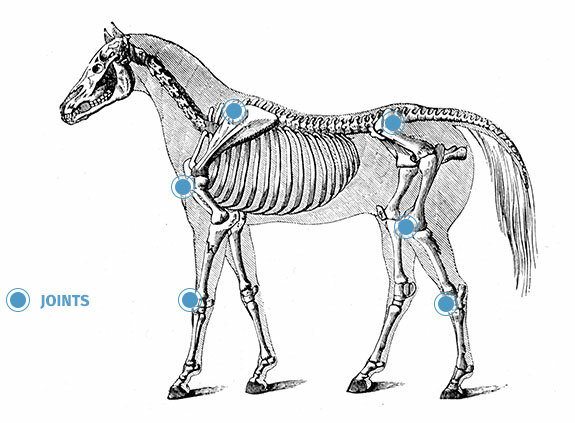 Equine osteoarthritis is the result of the breakdown of a joint’s cartilage; the cartilage is the connective tissue that allows the joint to move smoothly as it distributes weight throughout the joint, acting as a shock absorber. When the cartilage is damaged, either by an impact or by regular “wear and tear,” it is unable to heal or regenerate. This breakdown causes inflammation in the joint. Although your horse may not show obvious symptoms early on, it is important to pay attention to stiffness, which may fade once your horse warms up. The goals of treating equine osteoarthritis are to minimize pain, lameness, and further deterioration of the joint. Although osteoarthritis is not curable, it is possible to manage your horse’s pain and discomfort, control swelling, prolong athletic function, and maximize the horse's lifespan. Non-steroidal anti-inflammatory drugs (NSAIDs) are one of the main medical treatments for osteoarthritis. An osteoarthritis-affected joint can also be injected with various medications, such as corticosteroids, which are a potent anti-inflammatory medication, or hyaluronic acid, a normal component of synovial fluid that increases lubrication. Hyaluronic acid (HA) may also be injected intravenously to have an effect on the whole body. Although osteoarthritis is a progressive disease that will worsen over time, there are viable options for slowing the progression. Discuss treatment options with your veterinarian to develop an individual treatment plan for your horse. can help your horse's joint health.